The promoters of Tucson, Arizona’s SOUTHWEST TERROR FEST have finalized the massive lineup for the 2014 installment of the event, unveiling an incredible listing of bands that takes this now annual extreme metal gathering up to an entirely new level. Behold, SOUTHWEST TERROR FEST III: THE WESTERN FRONT! On October 16th, 17th, 18th and 19th, 2014, the third episode of the only major multi-day metal festival to annually invade the lower western territory of the US will bring an incredible collective of bands into Tucson for SOUTHWEST TERROR FEST III: THE WESTERN FRONT. Having stepped up the hosting venues for this year’s gathering, the three main nights’ events will be held at the historic Rialto Theatre in Tucson, with the kickoff show on Thursday and each night’s after show throwdowns taking place at nearby The District Tavern. 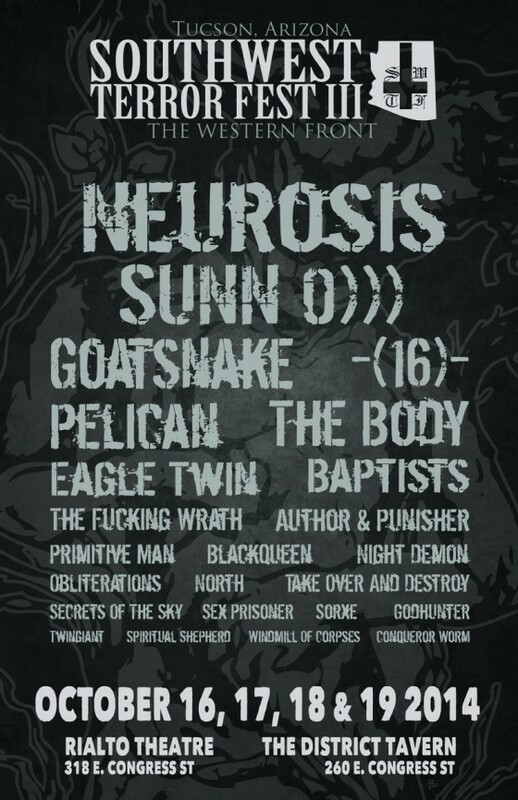 SOUTHWEST TERROR FEST was conceived and implemented in 2011 by members of Tucson-based underground acts GODHUNTER, INOCULARA, DISEASED REASONand GREAT AMERICAN TRAGEDY in conjunction with local venues and businesses, in order to bring a full-bore event to underground music fans the Southwestern portion of the country. 2012’s event doubled in size from the maiden voyage, and now the third installment of the crushing event will bring more auditory damage to the city than ever before. Actual day-to-day lineups, ticketing info/packages and more on SOUTHWEST TERROR FEST III will be released in the coming weeks. For any info and press inquiries on SOUTHWEST TERROR FEST contact the event’s official propaganda coordinators at The Earsplit Compound.